If you think recording professional audio means you have to go to a commercial recording studio, or else buy (and learn to use) expensive and complicated gear, we’ve got great news! You don’t need to do either. But audio recording is very technical and hard to learn. So if you don’t have a lot of money it may seem like you’ll never be able to record your songs or start that voice-over career. It really feel like you’re stuck. 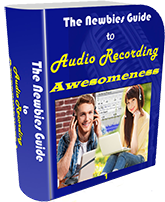 Newbies Guide To Audio Recording Awesomeness Does Both! Spend your valuable time actually creating awesome recordings. At home, and on your own schedule. Our short but powerful video tutorials show you only what you need to know, without wasting your time. You’ll be up and running in just a few hours. Even better, you’ll be able to create incredible audio with very inexpensive gear. This a series of tutorial videos that starts at the very beginning. In Part 1 you can start with no experience and spend no more than about 5 bucks on gear. All you need is a computer and a computer microphone. Even one of those plastic PC mics is fine at this point (that’s where the $5 comes in). You’ll be using free recording software called Audacity to learn the basics of audio recording. This 9-lesson (17 total short but powerful videos) course is chock-full of incredible home recording tips. Lesson 5: Multi-Track Recording, (2 parts) – Learn the “Killer App” of audio recording, over-dubbing…otherwise known as “multi-track recording.” How to use the free recording software, Audacity, to make your 1st multi-track recording! Lesson 5a: Singing Harmony With Yourself” Even if you’re not a “singer,” this is mind-goggling awesome! Be your own backing vocals, acapella group, doo-wop group, or even choir! Lesson 5b: Vocal Doubling – How to double-your voice to get the sound so popular in hip-hop and pop recordings, as well as in radio ad TV ad voice-overs. Lesson 8: EQ&FX pt2 – Using FX To Solve Audio Problems: Learn how to fix “P-pops” (also called “plosives”) using equalization (EQ). Lesson 9: The Pros and Cons of the Zero-Five Dollar Budget – All previous lessons have been do-able on a “0-5 dollar” budget. That will be enough for 80-90 percent of you. Learn the limitations of that budget level, and how to level-up for about $50 per level! In Part 2, we raise things to a whole new level, taking you well into the realm of professional quality audio recording using the incredible software called Reaper, a professional audio recording program costing and insanely low price of $60! We’ll show you how to use the same techniques the pros use. You get 17 lessons taking you from the basics of creating a voice-over narration to recording an entire pop song. True multi-track recording with panning, track effects, etc. How to use virtual instruments and MIDI – you’ll use Reaper’s built-in virtual keyboard and synth instrument and some free drum samples! 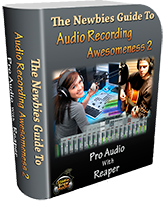 The Newbies Guide To Audio Recording Awesomeness 1 and 2 packs both parts into one course. All 23 lessons (a total of 36 short awesome videos) are included as streaming videos you watch right from our site, along with PDF transcripts of each video. And if you wish to download the videos to your computer, we also provide links for you to do that so you can watch the videos even if you are not on-line. Immediate access to all the videos in the course. Note: Since there are so many videos (35 in all), and that would be one HECK of a download, you will be given a log-on to homebrewaudio.com in order to access and stream/watch the videos from there. Once on the page, you can download any or all of the videos to your computer if you like. If you purchase both courses separately, it would cost $84. So you save $17 with this full course – with the normal price.